Remember, you don't need dance training. Spiritus is open to all interested men, women and teens. 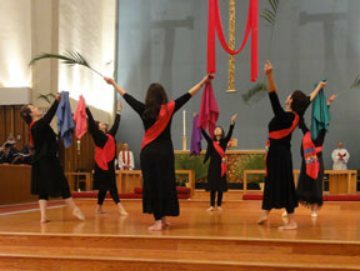 Just join us for practice at 12:15 p.m. on the second and fourth Sundays in the Main Church. The incentive for a dance may come from a request by the Rector or Organist/Choir Master. It may also come from an inspiration of the Director. The choreography itself comes from Mary Alice, often with input from the dancers. Presenting the dance on Sunday morning!